If We Agree To Work With You - We'll Guarantee Profitable Results! All our clients are given our 26 Week Guarantee! We Guarantee to Increase your Monthly Gross Profit by more than your monthly investment in our services! We Only Offer To Work With Those…We Know We Can Help! LibAbun Business Angels, Coaches and Trainers, are also Keap & Infusionsoft by Keap Certified Partners, we specialise in helping Small Business through our Business Consultations and Business Coaching with the successful implementation of the Keap & Infusionsoft by Keap CRM systems to transform all areas of your business We only offer to work with those businesses we know we can help, that’s a guarantee. To assess if we can help you, we take you through a complimentary ‘Business Growth & Automation Strategy Session’ which will clearly outline to both you and we at the LibAbun Team, what are the development opportunities available to help you. For all the businesses we do work, we are happy to offer our LibAbun 26 Week Guarantee. If after the initial assessment we conduct with you there are enough development opportunities within your business, then we will offer to work with you as a Business Consultation Clients and we offer the following Guarantee on the results you will receive from our service. 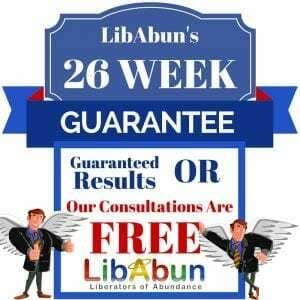 If our LibAbun 26 Week Guarantee intrigues you. Complete this form to qualify for a 1-2-1 ‘Business Growth and Automation Strategy Session’ with one of our ‘LibAbun’ Business Coaching or Consultation Team to see if we can demonstrate how we can help you deliver more profitable results and offer our Guarantee. Note: We will only offer to work with you if we can demonstrate profitable results during the meeting. 1. We Guarantee to get results, and that you’ll be able to “Find our Fee” in your business within 26-weeks of LibAbun working with your company … or your coaching/consultations are FREE. Our business coaching and consultations programs to help you successfully implement the Keap & Infusionsoft by Keap CRM have been tested and proven all over the world, so when you hire LibAbun, and work with us for a minimum of 26 weeks, you WILL get results. As part of our LibAbun 26 Week Guarantee, regardless as to whether you primarily wanting other forms of results, in terms of saving more time, a better team or more money … if you are making a good-faith effort and doing the required work assigned to you; you attend all coaching or consultation sessions, agreed upon workshops and you complete all of your committed decisions and homework assignments on agreed-upon dates … and you are STILL not seeing an increase in Gross Profit by more than our Monthly Consultation Fee by the 26th week, we will coach you FREE until you do … no questions asked! No matter how uncomfortable it may be, or how hard it is to share with you the realities of your business and the changes you need to make. When you hire us at LibAbun Business Angels Coaches and Trainers, you will have the “unreasonable friend” and personal business mentor and advisor you and your business need to succeed. We can play a role where we can act as your ‘Mini Board Of Directors’, when you don’t have one. You will be held accountable for everything you say you will do, and your business will get the push it needs so you can get the results you really want in your business. As part of the LibAbun 26 Week Guarantee we will teach you how to apply Keap & Infusionsoft by Keap successfully into your Business. This is just a tool, so we offer you and your team a new education and knowledge so you can use Keap & Infusionsoft by Keap to address any business situation. We will guide you with proven systems and strategies designed to give you a “business re-education” and help you automate many facets of your business, that will allow you to profit in terms of more time, better team and more money. Not only will you be able to unlock the true growth potential of your company, you’ll be in the “driver’s seat” of your own business, equipped with a “map” and a “license” to take it and drive it wherever you want to go, with your LibAbun Business Coaching and Consulting by your side. Our working relationship will involve a level of trust and understanding about the proprietary nature of our business coaching and consulting strategies and the proprietary aspects of the numbers and nature of your business. Because of this, we guarantee a confidential business relationship with you during the course of our work together. You and your business are unique. Because you are relying on our experience in working with businesses of all kinds, you can be assured you will have a clear understanding of the nature of any program or automation we recommend, and that your expectations will be properly managed as to anticipated outcomes and results. Only this way will our LibAun business coaching and consulting get the most out of you and your business. Not only will you be shown a number of systemised ways to successfully build your business, you will also have complete and exclusive access to hundreds of strategies and tactics that make up our entire proprietary business coaching and consultation system. 7. We Guarantee to show you how LibAbun defines business success, and how to build a commercial, profitable enterprise that can work without you. Even if you are an owner who loves business and who loves working “in” your business every day, at LibAbun we will show you how to build a company you can work “on” whether you show up every day or not. Regardless of your ultimate goals, you will learn the strategies, systems and advantages of the LibAbun definition of a successful business. If you would like more information on the business coaching, mentoring and consultation services we offer click here, if you would like to find out how our business coaches and consultants have helped other businesses like you then click here.